We offer four grades of gas and four types of diesel. Ethanol Free 90 Octane fuel available at Carter station. Use cash, credit or debit card at the pump. Fuel discounts with cash, check, debit card or Shell card purchases. Our Carter Avenue gas pumps are open to the general public 24 hrs a day. 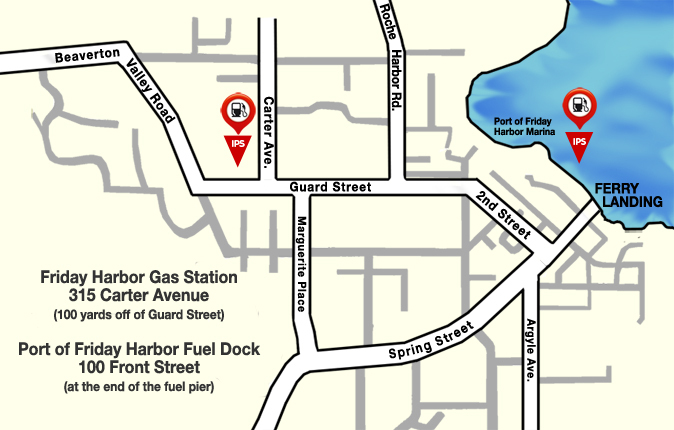 Our Marine Gas Station has gas, diesel, and propane available 7 days a week at the fuel pier. Home delivery of heating oil, off-road diesel, on-road diesel and regular gas on San Juan Island and Orcas Island. Volume discounts for fuel delivery. Need help? Our staff is here to assist you with whatever you need M-F 7:30 am – 5:30 pm. Our pumps are open 24 hours a day to the general public. You can pay by cash, credit card or debit card at the pump with fuel purchases. Discounts for cash, check, debit card or Shell cards. We carry Regular Shell Gas, Dyed Diesel, and Propane plus full line of Chevron lube and oil products at the fuel dock in the Port of Friday Harbor. Open 7 days a week. Boat US members get a 5¢ discount. Heating Oil, Off-Road Diesel, On-Road Diesel and Regular Gas delivery to your home, farm or business on San Juan and Orcas Islands. Also oils, lubes, and greases from small packaging to bulk drums.